We sit at the helm of opportunity. The opportunity of change. Change from hardened hearts to the awareness of God's love. Change from discrimination to the love for neighbors regardless of color, creed, or location. Change from poverty and starvation to a world nourished with good intentions. Change from abuse to gifted conversation. Change from pollution to a cleaner planet. Gifted we all are with specialized talents. Use your God-gifted abilities and take the opportunity to change our planet. Grab hold of the helm. Everyone is needed. The actions of one greatly affect the whole. Spiritual Verse Today are inspirational reads from Award-Winning #1 Best-Selling author Sharon CassanoLochman. Thousands have found daily comfort and hope through CassanoLochman's poetic verse. Heavenly warrior, you are indeed. Majestically speaking. Actions driven from your heart-place. Shine brightly, my friend. Go forward with strength. Ignore the bantering from those heavily drugged from ego's sleep. Speak. Write. Engage. Create. Teach by example through words and actions. Human you are. With a crooked-trail past. Model of spiritual growth with good actions seeded. Shine, for you will guide souls drowsy from sleep. Waking in the dark. Searching for Light. Joining the many. Hand to hand. Heart to heart. Regardless location, religion, or nation. Gaining momentum. Beacons stepping forth from every direction. Beacons of peace. Beacons of Light. Warrior of Light. Compassionately driven. Shine. Spiritual Verse Today's inspirational messages offer relief from the heaviness of life or crooked trails taken. The daily distractions that tug at the heart left untended. Sorrows overwhelming even on the brightest of days. The snippet of time sometimes wished undone. 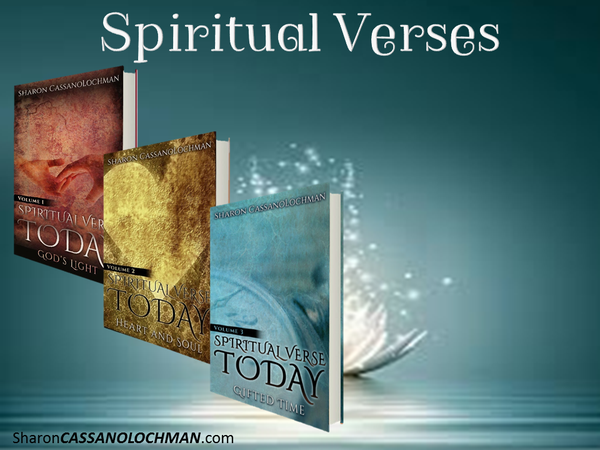 Join author Sharon CassanoLochman for a walk in Spiritual Verse Today. Order together or separately.